Stephen Hawking leaving only grief for the majority of the world community. His departure squarely in the birth date of Albert Einstein, March 14, also coincides with the annual Memorial for the constant Pi (Pi Day). A coincidence or a statute, the death it becomes a specific moment of mutual sliced. He spent his entire life to continue to challenge the natural order of the universe which is since centuries become the discourse is never finished dissected, spiced up. He claimed to have been on holiday to the niche of the universe the ultimate in; not physically, of course, but rather through the imagination and empirical themselves on paper. Encounter many people, when dealing with the Hawking, often are also attributed by magnus opum of her work entitled A Brief History of Time. His publication it was reaping praise many circles. Although at the beginning of its publication, the paper was rejected, even booed as a mere hoax. But, Hawking remained unruly and continue to introduce it to the inhabitants of the Earth via the question that raise their scrunched up forehead. Confined to a wheelchair, Hawking gave lectures to college campuses. Physical limitations cannot be the reason to stop working. Although since was diagnosed with Motor Neuron at a young age (22 years old), he was desperate. Any worried because her doctor predict age of not more than two months. The public was astonished to hear it. However, the medical predictions turned out to be wrong. He still existed until March 2018. "What Hawking is really no? " said my friend who cultivate the study of physics. He could not believe it when someone's death also means dims works. Heritage science that Hawking publish it still exists until whenever, as scientists-scientists previously. During their writing to read, during this time they stay alive in the reader's head. Goodbye, Maestro. When He once said justice must be initialized since in mind, then position the Stephen Hawking as a scientists also should be positioned as fair as possible. I have a pinch of stories about it. When looking back, it happened so many years ago. While still wearing the white uniform of gray. My friend clearly says do not like to read, study, and reflect on what has been Hawking wrote on each of his works. The reason is indeed very cliche, i.e. when hearing impressions on YouTube when He was interviewed and admitted as an atheist. Speech is it makes my friend was shocked. The Physics lessons he loved High School since the time it was quickly abandoned. Especially avoid black hole matter and all the formulas that Hawking have to offer. We debated the question how the positioning of science and faith. As someone who is religious, he is upset because the recognition of Hawking it. Atheism which is a private attitude over the firmness of faith someone apparently mixed up in the realm of scientific findings. In other words, science and faith are two different domain context, but he considered one box. No wonder when he abandoned the theory of Hawking only because of overlapping principle. I guess see Stephen Hawking need wisdom attitude. Affairs of atheism that Hawking is not recognized then stopped studying a number of bids made are practiced. If not so, a series of disappointments because of contradiction the private principle will continue to be prominent. Is there injustice see Stephen Hawking begins. Another valuable legacy of Hawking his work is unmatched. Though verbal ridicule stumble, track record in the world of modern physics Hawking follow throughout his life. The obstacles of the other continued to attach his life, yet he is consider as the wind then. He tends to see the real obstacle lies in the universe. Many questions, therefore, he ask without know the time in his personal desk until her family worried. 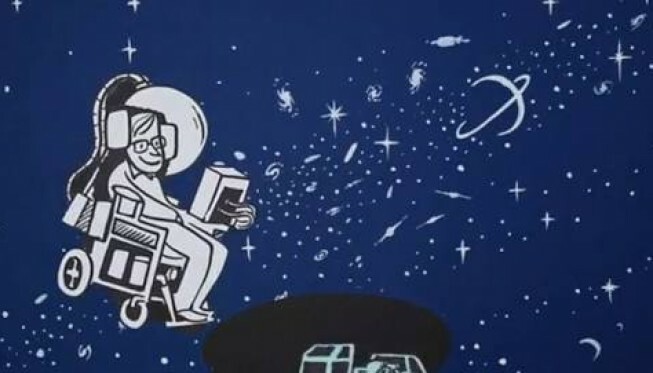 Hawking is too valuable to ignore, even forgotten by future generations. The position thinking that poured in many publications like the Golden barn. Without digging further, mountains of gold it only as a collage of nature. See the opportunities that new generation, scientists are already properly exploit the crumbs of thought Stephen. See Hawking from the perspective of personal no exhausted opened. The concept of black hole that became a point of his masterpiece remains a strong thesis will dialectic between science and religion. These two dimensions is often disputed part of society. Though both are not an impossible distinction traced red thread relevance. It's just that, until now, pulpit dialog to reconciling science and religion in the context of the findings of the Hawking is still minimal. I see a great opportunity to bring together what is considered taboo in religion and what modern science declared. In order for the two-poles could not divert each other face, researchers post-Hawking have to do interdisciplinary research. Mediating knowledge, in other words, can be created through this activities. An interdisciplinary research, with seated dimensions of religion and science as the primary variable, able to establish greetings scolds healthier. The increasingly horizontal cracks stretchable up to this slow-growing gradually refer culturally. The public certainly will also reap the positive impact.